Philadanco in Anthony Burrell's "Conglomerate." Gearing up for its 50th anniversary in 2020, Philadanco celebrated its hometown when the company opened its “Dance Philly Style” program Friday night at the Kimmel Center’s Perelman Theater. It features three world premieres and a company favorite from four choreographers who spent much of their creative time in Philadelphia. A program of many styles, it highlights the dancers’ fantastic technique and versatility — and the fact that BalletX isn’t the only company in town constantly presenting new work of national caliber. 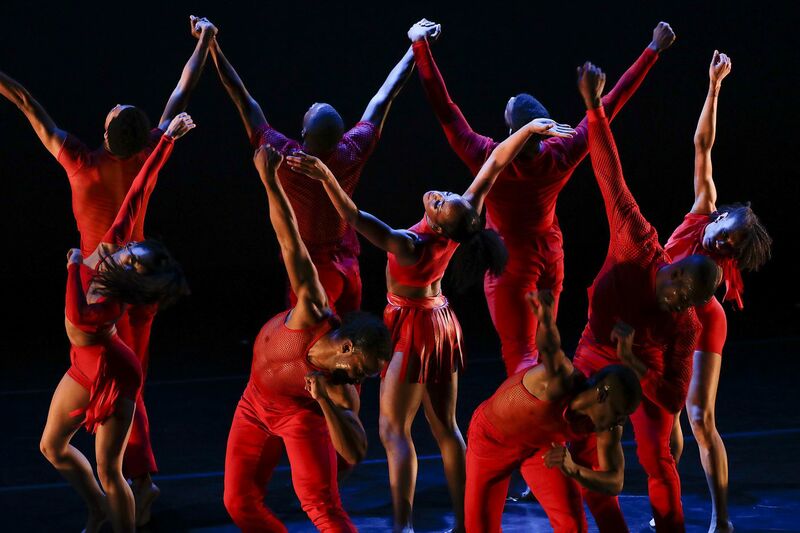 This program is the second time this spring for Philadelphia audiences to see work by Rennie Harris (Alvin Ailey toured his Lazarus here last month), likely the nation’s most celebrated hip-hop choreographer. Harris grew up in Philly, rehearses at Philadanco’s studios, and shows his work all over the world. But years can go by without seeing his work here. Philadanco in Rennie Harris' "Fear." For the Philadanco run, Harris created a world premiere, Fear, which put the dancers, dressed in black, on high alert to an offstage threat. Dancing on a foggy black set, the dancers reacted to pulsating, scraping sounds as intensity built like a scary scene in a movie. The program notes describe the resilience of African Americans who’ve been “torn, worn, and discarded.” Their fear is unnamed, but in the context of the Black Lives Matter movement could certainly be fear of police brutality or of violence more broadly. Or it could be fear of the next unknown. Their ability to recover comes as a relief when the intensity is broken up with sections of GQ, a style of Philadelphia street dance, performed to the music of the Cinematic Orchestra. The movement is heavy on the footwork, with small, shuffle-like kicks and arms kept close to the body. It is easy to forget in the comfort of the Kimmel Center, but resilience doesn’t necessarily wipe out fear, and in this dance the dark unknown returns. If Harris represents great current success, Dawn Marie Bazemore is the future. The former Philadanco dancer is a choreographer on the rise, presenting her third work on the company (there are more opportunities to see her work at the Dance Garage next week). Bazemore’s piece for the Philadanco program, Oshun, is based on Yoruba traditions of western Africa and the goddess that represents the many sides of women. A channel of snow falls on Philadanco in "Oshun," choreographed by Dawn Marie Bazemore. Oshun opens with Brenda Dixon Gottschild, a dance scholar and professor, reciting poetry from Langston Hughes and Sonia Sanchez. Her protégés — the dancers — line up, surround her, and respond to her words. They dance to the poetry, to silence, to their own claps and stomps, and to the music of Max Richter and Grandmaster Flash & the Furious Five. Bazemore’s ballet is multifaceted — and is nearly too much to absorb — but culminates in the most lovely moment when Oshun, who is also the goddess of water, sends a channel of snow down to bless the dancers. Anthony Burrell, who has choreographed for Beyoncé and Mariah Carey, presents a little bit of everything in Conglomerate. Set to a music compilation by Darryl J. Hoffman, it has the dancers, all in red, showing off their athleticism — especially the men, who fly across the stage in split jumps and other impressive tricks. The program also features La Valse, by Gene Hill Sagan, who was resident choreographer at Philadanco from 1976 to 1991. Set to Ravel, it is a delight of balletic steps, swirling skirts, and flying leaps, all performed impressively at a very fast pace. All these pieces showed Philadanco to be among the best contemporary dance companies in the United States, which prompts the question: What will happen to this top-notch company after next year’s 50th anniversary? Founder Joan Myers Brown, 87, has said it will be her last year and that she does not have a successor. Philadanco in Gene Hill Sagan's "La Valse."